The bi-lobed structure of 67P/Churyumov-Gerasimenko, shown in this image from the ESA's Rosetta mission, resembles the structure created in a new simulation. 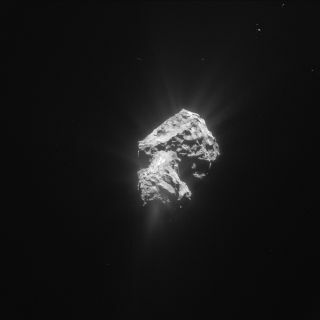 Why do so many comets have a two-lobed, "rubber ducky" shape? It may be the result of gentle collisions and mergers, new simulations reveal. Images of Comet 67P/Churyumov-Gerasimenko taken by Europe's orbiting Rosetta spacecraft show a two-lobed shape that makes this icy space rock look a bit like a rubber ducky. This shape, along with layered structures in the comet's body, has been seen in other comets studied by spacecraft as well. New, 3D simulations suggest that these features are not hammered out with great force, but shaped by gentle collisions and mergers over time. "Reconstructing the formation processes of comets can provide crucial information about the initial phase of planet formation — for instance, the initial size of the building blocks of the planets, the so-called planetesimals or cometesimals in the outer solar system," Martin Jutzi, of the University of Bern in Switzerland, said in a statement. Comets are small, icy, rocky bodies surrounded by a "coma" of gas and dust. Some scientists think that comets delivered water and other organic material to Earth that helped life to evolve. To investigate how comets formed, Jutzi worked with Arizona State University colleague Erik Asphaug to model the early solar system. The researchers applied 3D collision models to their simulations, constrained by the observed shape and topographic data from comets such as 9P/Tempel 1 and 103P/Hartley 2. With these models, the researchers wanted to first understand the basics of how bits of material would gradually stick to comets, building up their mass and changing their internal structure (including that two-lobed rubber ducky shape). Frames from the three-dimensional model show two icy spheres impacting at slow speeds, separating, and then re-impacting a day later to form a bi-lobed structure. "How and when these features formed is much debated, with distinct implications for solar system formation, dynamics, and geology," Jutzi said. In a video sequence based on the researcher's computer simulation, two icy spheres with a diameter of about 0.6 miles (1 kilometer) travel toward one another. They collide at "bicycle" speeds, study team members said. Following this initial collision, the two spheres begin orbiting one another. After the smaller body has left traces of material on the larger, they separate. The smaller body returns within a day to re-impact the larger one. In the video, the two spheres ultimately merge to create a two-lobed frame, similar to Comet 67P. "These slow mergers might represent the quiet, early phase of planet formation, before large bodies excited the system to disruptive velocities, supporting the idea that cometary nuclei are primordial remains of early agglomeration of small bodies," Jutzi said. The same process could also have occurred later in the solar system's development, among debris clumps ejected from much larger parent bodies. When combined with future space missions that use radar to directly image the internal structure of comets, three-dimensional simulations serve as an important step in understanding how cometary nuclei formed. The research was published online last month in the journal Science.